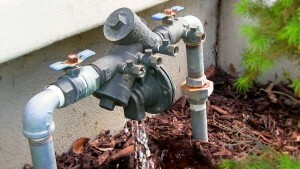 Backflow is the reversal of the normal water flow caused by a sudden change in water pressure. This change in pressure could contaminate the public water supply when a cross connection exists. 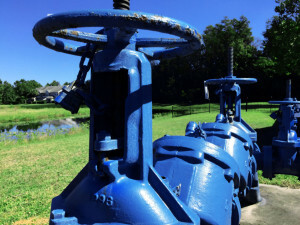 Most municipal codes will require the installation of a backflow prevention device to prevent or potable water from back-flowing into the non potable lines of any residential , commercial or industrial system preventing any degree of hazard. The contaminated lines not only consist of pesticides, chemicals and fertilizers but also feces and other harmful materials that could be cause serious health problems. With the installation and maintenance of a back flow preventer, non potable water no longer has access back into the line causing cross contamination. When a backflow preventer is properly installed and maintained, the drinking water at the residential or commercial establishment can remain clean and uncontaminated. To ensure the backflow preventer is well maintained, annual backflow prevention testings will need to be done to ensure quality. Making sure your back flow preventer is to code is imperative to keeping your backflow system maintained. A business can be subject to interruption and/or a fine if backflow testing is not to code and done in time. Sam T’s Plumbing is an Orlando based plumbing company with 30 years of experience in the field. We pride ourselves in providing the highest quality plumbing services in Orlando to all our customers. at Sam T’s Plumbing our certified plumbing technicians are licensed to i nstall, check and maintain backflow preventers in the Orlando, Poinsianna, Kissimme and surrounding areas. We offer 24/7 and emergency backflow prevention services. Call on us at Sam T’s Plumbing to be your number one source for backflow prevention!